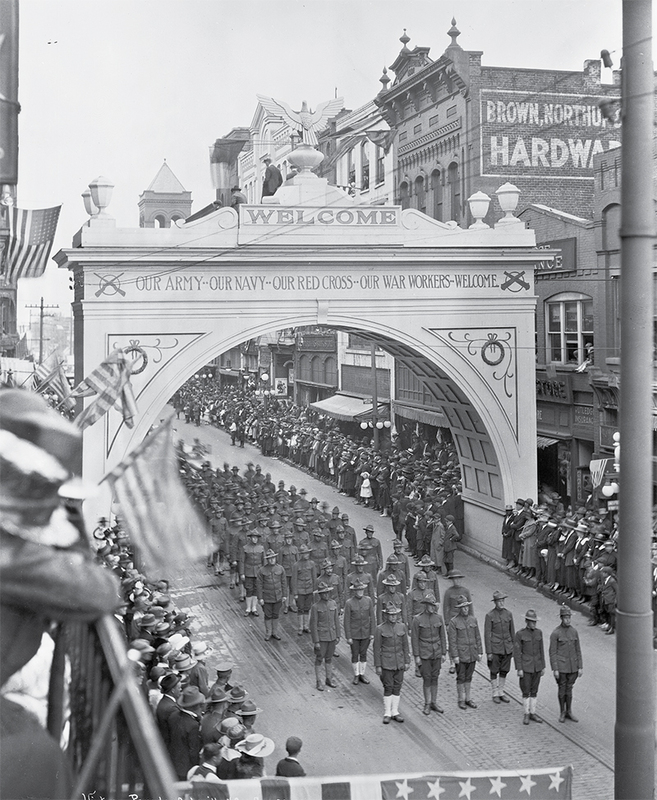 Back From “Over There” - To welcome troops home from the Great War in 1918, Asheville hosted a parade on Patton Avenue, complete with a victory arch. A century ago, the Asheville Citizen published insights from its court reporter, and the news, overall, seemed mighty good. It was right on the cusp of Christmas and at the end of World War I, imbuing the holiday with new reason for celebration. The import of the armistice signed in November 1918 was sinking in and seemed to signal an era of peace and democracy. Of course, the Asheville area had paid a price on the nation’s path to victory: several hundred of its residents joined the war effort, and more than 50 of them lost their lives. In the months that followed, Asheville welcomed its fighters home with medical treatment and a whopping parade that shattered the town’s attendance record, drawing upwards of 20,000 people to the streets, the newspaper estimated. The war had strained the community, with some basic resources in dwindling supply, but also gave it a sense of connection to places far away. Now that victory was in the air, the town found a heightened sense of purpose. The Asheville Citizen reporter noted the exultant mood and its significance, citing the town’s “splendid behavior” of late. “The week before Christmas, it appears, is no longer to be regarded as one to be dreaded by [police] officers.” The lawmen were grateful that the “bloodshed and slaughter” of past holidays were on the wane, with Asheville’s early adoption of alcohol prohibition largely credited for that.